This book focuses on the unconscious emotional inner conflicts that prevent women from experiencing happiness and success in their personal relationships and careers. Emphasis is on eliminating thoughts of self-blame and finding the root of these “dragons” through self-observation. Psychotherapist Good provides various cases of women sabotaging themselves, suggests strategies that each woman might take to overcome self-sabotage, and discusses actions chosen by the women to help themselves. 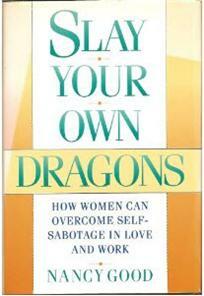 Recognizing the uniqueness and the role of each individual, Good presents a realistic view of overcoming self-sabotage and offers a flexible ten-point plan to help women “slay the dragons.” Good writes engagingly and realistically on a serious hidden problem among women.